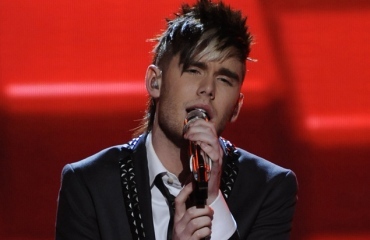 Colton Dixon performed ‘Bad Romance’ by Lady Gaga tonight on American Idol the Top 7. It is the same group as last week after the judges saved Jessica Sanchez with their only save last week. This week each contestant will be on the American Idol stage twice, the theme for this week is Now and Then. We are getting awfully close, can you imagine how much stress the contestants are feeling? The “singers” had to pick a #1 hit song from 2000-2012 and then sing an older soul song. The mentor for tonight’s show is Jimmy Levine. Colton is thrilled because Ryan calls his sister up on stage, she also auditioned but she didn’t make it to the show – she tells Ryan how proud she is of her brother. Jimmy thinks Colton needs to really try to pull out the high notes from the bottom of his sole tonight. Colton feels like he is taking on a new monster tonight, but he is not going change who is is. Colton is singing “Bad Romance” by Lady Gaga.